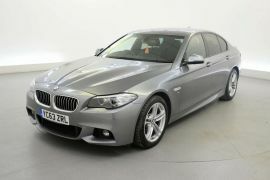 Used BMW 5 Series under £23000! Imperial Car Supermarkets are one of the UK’s key stockists of used BMWs. We sell only the best handpicked quality used cars, and aim to offer truly excellent customer service, prices and used car finance. This Grey BMW 5 Series – 520d M Sport 4 dr Step Auto has only 21,110 miles on the clock, and comes in at well under £23000. This luxury used car is both affordable and classy and has £2570 of BMW factory fitted extras too! Why not arrange a test drive today? You’ll love the black Dakota Leather Heated Sports Seats, SatNav, Front & Rear Parking Sensors and other features of this stylish car. Take a closer look here, you can see loads of photos inside and out, a spin and zoom of the exterior and even an interior 360 degree view. With so much detail readily available on our website, it’s worth driving from a considerable distance to see all the cars Imperial Car Supermarkets have on offer – lots of our customers already do! If you have any questions please do get in touch 023 8098 6252, our UK sales team are on call until 9pm Monday – Saturday and until 6pm on Sunday. Imperial Car Supermarkets have used car showrooms in Southampton, Northampton, Fleet and Portsmouth.